Earlier, a Russian official had expressed skepticism with the U.S. explanation that the situation in Ukraine had driven the president's decision, not "the domestic political situation in the U.S."
BUENOS AIRES, Argentina — President Donald Trump said Russian aggression with Ukraine is the "sole reason" he canceled a planned meeting with President Vladimir Putin here as he sparred with Moscow over the motivation for his decision. "We don't like what happened," Trump said of Russia's seizure of two dozen of Ukraine's sailors and three of its ships over the weekend. "Hopefully, they'll settle it out soon." Earlier in the day, Maria Zakharova, the top spokeswoman for Russia's foreign ministry, suggested Trump had abruptly nixed the one-on-one because his former fixer, Michael Cohen, pleaded guilty Thursday to lying to Congress about a Trump real estate project in Moscow. "Was Ukraine’s provocation in the Kerch Strait the true reason for the cancellation? We have heard the official explanation and taken note of it," Zakharova said. "But is it true? I think the true reason is rooted in the domestic political situation in the U.S."
Trump had announced Thursday that he wouldn't meet with Putin in a tweet sent a couple of hours after Cohen's guilty plea and just minutes after Air Force One departed Washington for the summit. "Based on the fact that the ships and sailors have not been returned to Ukraine from Russia, I have decided it would be best for all parties concerned to cancel my previously scheduled meeting in Argentina with President Vladimir Putin," Trump wrote. "I look forward to a meaningful Summit again as soon as this situation is resolved!" On Friday morning, White House press secretary Sarah Sanders insisted that the decision had nothing to do with special counsel Robert Mueller's investigation into Trump's ties to Russia. Trump began his day Friday by tweeting about the Mueller probe, and some of his critics have said that it could be a major distraction from his foreign policy goals at the G-20 summit here. The Russian news agency RIA Novosti reported Friday that a Kremlin spokesman said Trump and Putin would "meet on their feet" at the summit rather than have an official sit-down. But a White House official said "there is no scheduled pull aside." 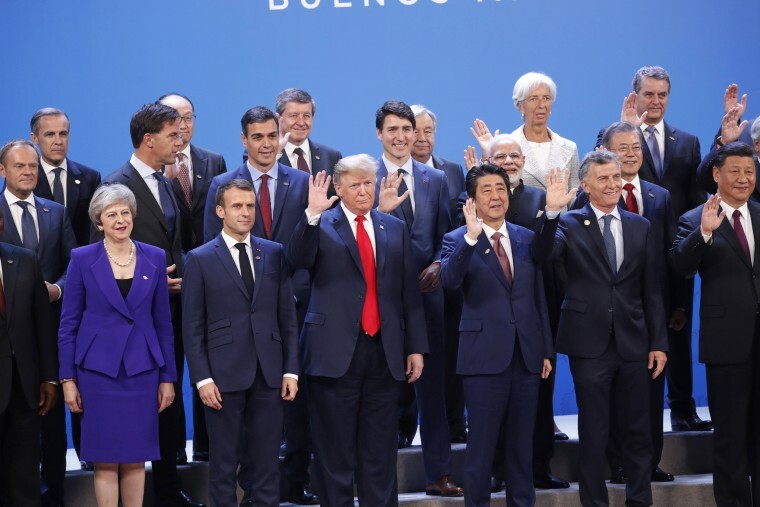 Trump did not appear to have any interaction with Putin or Saudi Crown Prince Mohammad bin Salman, who has been accused of ordering the murder of Washington Post journalist Jamal Khashoggi, when the G-20 leaders assembled for a group photograph to kick off the summit. Putin and bin Salman greeted each other with an effusive high-five-like handshake and big smiles.